Order one for each MD office and location to be fully compliant. 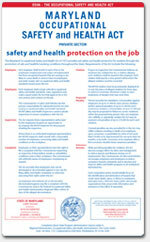 The OSHA poster is included on the Maryland Complete Labor Law Poster. When you order the Maryland Complete Labor Law Poster, it will satisfy your State, Federal, and OSHA posting requirements with one poster. 01/2018 - Earned Sick and Safe Leave - New posting requirement for the state of Maryland. 10/2016 - Equal Pay for Equal Work Act - Update includes new protection clause in regards to gender identity and more guidance on wage transparency amongst employees. 08/2015 - Equal Pay for Equal Work Act - Updated to include statutory guidance for enforcement of law and new email listing added. 12/2015 - Minimum Wage Poster - Updated with minor reformatting changes along with new email and fax number. 02/2015 - Equal Pay for Equal Work Act - Minor revision includes new department logo, addition of state seal, and new phone number and email listing. 02/2015 - Discrimination - Updated to include Gender Identity as a protected class against employment discrimination. 01/2014 - Discrimination Notice Poster - Update includes inclusion of gender, ethnicity and physical and mental disability as protected classes, along with reformatting of the poster. 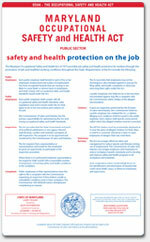 02/2013 - OSHA Private Sector - Now adding Private Sector OSHA to complete labor law poster. 05/2015 - Family and Medical Leave Act (FMLA) - Update includes minor reformatting and slight changes of verbiage regarding the usage of FMLA. Many industries such as the restaurant, retail, construction, and professional use the Maryland Complete Labor Law Poster to satisfy their compliance requirements for State, Federal, and OSHA. When posted in an area frequented by employees, the Maryland Complete Labor Law Poster puts a business in full compliance. Federal contractors and subcontractors are required to display more postings in addition to the general State, Federal, and OSHA regulations. Please click here to see the federal contractor and subcontractor posting requirements. Ensure your full compliance by posting the Maryland Complete Labor Law Posters with the federal contractor-required postings.